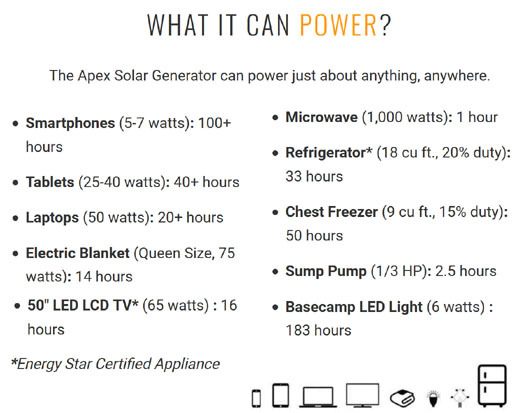 The Silver Apex Solar Storm Kit will give you simple, reliable, off-grid power wherever you need it. Perfect for power outages, camping and RV’ing, or as a power source for remote cabins. Easy to carry. Quick to assemble. Unlimited fuel supply. Recharges fully in 5-6 hours of ideal sunlight. • A fantastic add on to any RV, Camper and Boat! Features plug and play Shore Power 30 Amp Output! 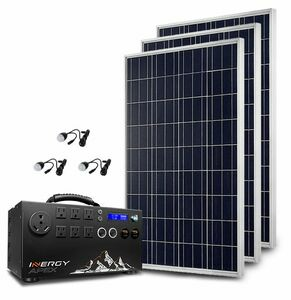 • Includes (3) Solar Storm 100 Solar Panels, a 30' Solar Panel Cable, (2) 6' Solar Panel Cables, an AC Wall Charger and 3 Basecamp LEDs! • The included Basecamp LEDs output 400 Lumens! • Features the longest lasting Lithium battery on the Market! With a Battery Life Expectancy up to 2,000 Cycles or 10 Years! • Features LCD display for easy to read system information. • Compatible up to 500 Watts Maximum Input, with a 3 Hour Recharge Time at Maximum Input! • Allows for easy Battery Expansion and accepts Inergy's external Lithium-Ion, 12V lead acid or AGM deep cycle battery. • The built-in MPPT Charge Controller allows for faster and more efficient charging! • Features (6) 110 AC Ports, (1) 30 Amp RV plug, (2) 12V DC sockets, (4) USB Quickcharge 3.0 + USB-C outlets and (2) Base Camp LED ports! • The included Basecamp LEDs plug directly into the Apex for a 20 foot radius of light at just 6 Watts per hour! The Apex Lightweight Portable Solar Generator can be recharged from a regular wall outlet. The Apex Lightweight Portable Solar Generator can be charged by connecting a compatible DC input such as a 12V charger found in your vehicle. The Tech Protect XXL EMP Bag is perfect for protecting your Kodiak Generator, Small Solar Panels, Basecamp LED’s, or other electronics like laptops (all sizes), gaming systems, power tools, digital wheat grinders, large emergency radios, etc. It also features an outstanding 38-pound puncture resistance to prevent cuts and tears. To maximize the versatility and applications of the Kodiak Solar Generator, you can now recharge the unit using the 12V Car Charger! Designed for the Solar Storm 100 Watt Solar Panels, the 6 Ft Extension cables will allow the user to connect multiple Solar Storm 100W panels to one another. 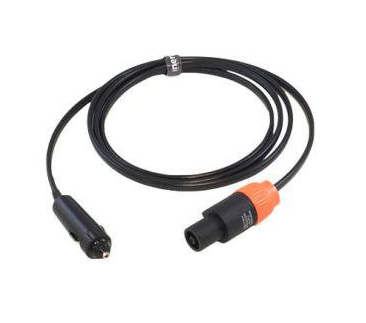 Designed for the Solar Storm 100 Watt Solar Panels, these replacement male-to-male Neutrik extension cables will give you an additional 30 feet between your Kodiak Generator and the Solar Storm Panels. Light up your journey with our high efficiency Basecamp LED hanging light, a revolutionary accessory for a revolutionary generator. Plug it directly into the Kodiak for a 20-foot radius of light at just 6-watts per hour. Chain-able for expandability and rugged enough to provide light in any environment, the Basecamp LED is a must for any Kodiak owner. All the versatility and power of the original Basecamp LED light is now available as a USB-powered model. Maximize the lighting power of the Kodiak by taking advantage of the four USB ports, or simply use it with a laptop or other portable power source. These lights are perfect for every situation. Uses only 5-watts per hour! The Solar Storm 100 Watt Solar Panel is the panel of choice for getting the most power per dollar. 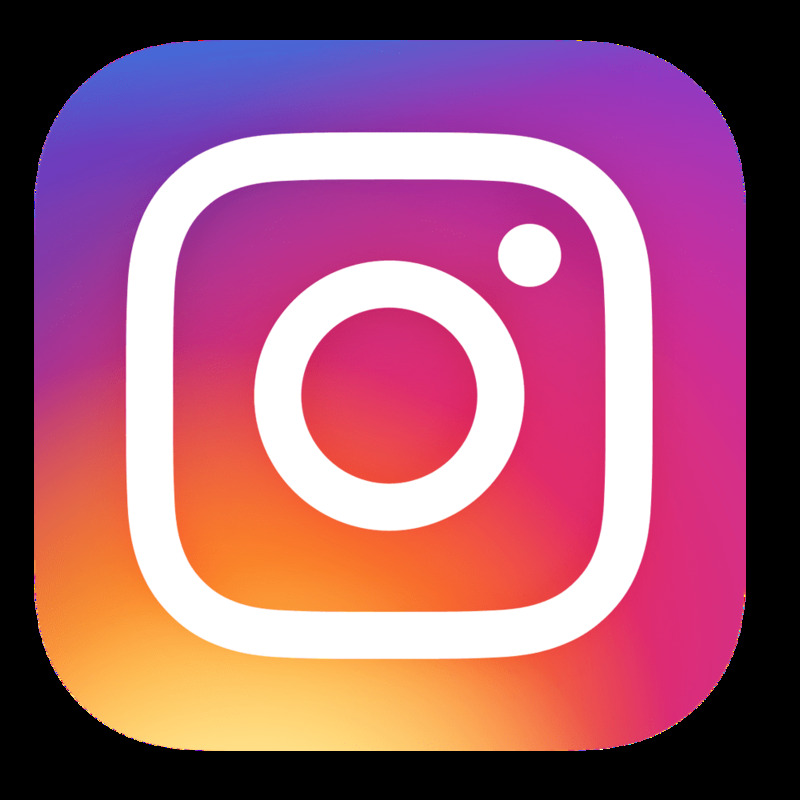 Portable enough for mobile applications, yet durable enough for permanent exterior mounting, this panel is a great balance for any use. The Polycrystalline PV cells are encased in tempered glass and framed in aluminum. One panel will fully recharge the Kodiak in 15 – 17 hours of ideal sunlight.